Nicholas Samios grew up in Livadi and graduated from the Kythera “Gymnasion” about 1949, then left for the United States to study Physics. Nicholas Samios received his B.A. and Ph.D. degrees in physics from Columbia University in 1953 and 1957, respectively. He first came to Brookhaven as a summer student in 1952, and joined the Laboratory as an assistant physicist in 1959. He advanced to senior physicist by 1968, served as chairman of the Laboratory’s Physics Department from 1975 to 1981, Deputy Director for High-Energy and Nuclear Physics from 1981 to 1982, and Brookhaven’s Director from 1982 to 1997. Since 1997, he has been a Distinguished Senior Scientist, and since 1998, Deputy Director of the RIKEN/BNL Research Center — a research center at Brookhaven that is funded primarily by the Japanese RIKEN laboratory to exploit both the theoretical and experimental physics potential of RHIC. Since 1970, he has also been an adjunct professor in the Physics Department at Columbia University. As a researcher, Samios made many of the particle discoveries that have helped define and lead to the acceptance of the “Standard Model” of particle physics, the currently accepted theory that explains all known particle interactions. In particular, he is noted for the discovery of the phi meson and the omega minus hyperon, crucial elements of delineating the symmetry of hadrons, which ultimately led to the quark model of elementary particles, now a pillar of the Standard Model. Samios also made significant contributions through a decade-long study of neutrino interactions, both at Brookhaven and at the Fermi National Accelerator Laboratory in Illinois, including the discovery of the charmed lambda (the first charmed baryon observed), and early measurements of neutrino electron elastic scattering and limits on neutrino oscillations. 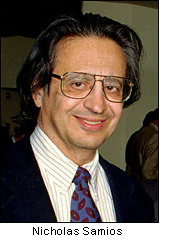 As Director of Brookhaven National Laboratory from 1982 through 1997, Samios led the effort to build the Relativistic Heavy Ion Collider, the world’s newest facility for nuclear physics research. Theoretical physicists had predicted that particle accelerators capable of colliding heavy atomic nuclei could produce a new state of matter known as quark-gluon plasma. In this state, the constituent quarks that make up protons and neutrons — and the gluons that hold the quarks together — would, for the first time since the dawn of the universe, exist in an unconfined state amenable to study. Under Samios’s vision and direction, Brookhaven built RHIC to perform these experiments. The collider became operational in 2000. Nicholas Samios, a senior physicist and former director of the U.S. Department of Energy’s Brookhaven National Laboratory, has been named the 2001 recipient of the prestigious Bruno Pontecorvo Prize by the Joint Institute for Nuclear Research (JINR) in Dubna, Moscow. The prize, awarded annually since 1995, recognizes “the most significant investigations in elementary particle physics,” as acknowledged by the international scientific community. The award recognizes Samios for his contributions both as a researcher in elementary particle physics, particularly neutrino physics, and as a scientific administrator. It will be presented at the 91st session of the JINR Scientific Council in Dubna on January 18, 2002, where Samios will deliver a talk on his work. Nicholas Samios, is a founder of a new group called the Eagle Alliance which calls itself a bold new nationwide movement to revitalize nuclear science and technology in America. The Eagle Alliance with headquarters in LaGrange Park, Illinois, declares that it wants “to achieve pro-nuclear planks in major political parties for 1996 elections, encourage a political mandate to accelerate a nuclear cure for cancer, establish a strong scientific basis for negligible health effects of low-level radiation, stimulate major use of food irradiation, develop strong media coverage showing the health benefits of food irradiation, build strong local support base for pro-nuclear political actions." 80-inch Bubble Chamber BNL publication 9065, available here as a 1.3 MB PDF file. PLANO 1957 Confirmation of the existence of the So hyperon. First measurement of the So mass. IMPEDUGLIA 1958 Confirmation of pe2 decay. EISLER 1958 Failure of universal Fermi interactions in the beta decay of hyperons. PLANO 1959 First direct determination of the parity of the po. BERTANZA 1962D Confirmation of the existence of the X(1530 P13) resonance. First evidence for the f resonance. CONNOLLY 1963 Firm establishment of the f meson. BARNES 1964E Confirmation of the W– hyperon. GOLDBERG 1964C Confirmation of the h' meson.